vintage blue, originally uploaded by ordinarymoment. For the table settings, we wanted to create a simple + pretty still life for everyone to enjoy while they ate their yummy food. I’ve always loved the turquoise blue of vintage ball jars and knew they’d make a lovely vase for our flowers + greens. We actually started collecting the jars the summer before our wedding, picking some up here and there when a good deal was spotted. I don’t think we ever paid more than three dollars for a jar, and even managed to score quite a few with lids. They work out beautifully to hold dried bulk goodies from the grocery. I even have one on display in our studio with the various rocks + shells my brother collected for us while on his Spain adventure. Once again, continuing the wedding love throughout the year. I discovered a big box of glass baby food jars in the art room that were collecting dust, so I brought them home for more noble purposes. We filled each jar with some leftover pea gravel from a gardening project, then carefully nestled a beeswax tealight in the bottom. I was able to buy the candles on Etsy made from Wisconsin beeswax, so that was even better! They brought a lot of warmth to the room with their flickering light. 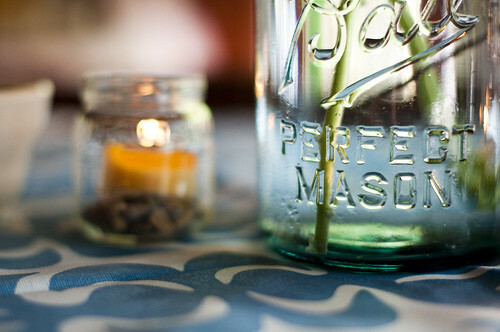 It ended up being super easy to find enough recycled + vintage jars to decorate every table. A frugal but almost elegant way to add some beauty to any table, no matter the occasion.